Utagawa Toyokuni I (1769-1825) Sawamura Gennosuke as Ume no Yoshibei from the play Suda no Haru Geisha Katagi, c.1800. Chutansaku ban. This slight print is an outstanding example of Toyokuni I’s portraiture. It is in the unusual chutansaku ban format (38cm x 13cm) and is from the end of the eighteenth century, having still the remnants of the classical period in its design, drawing and delicate colour. 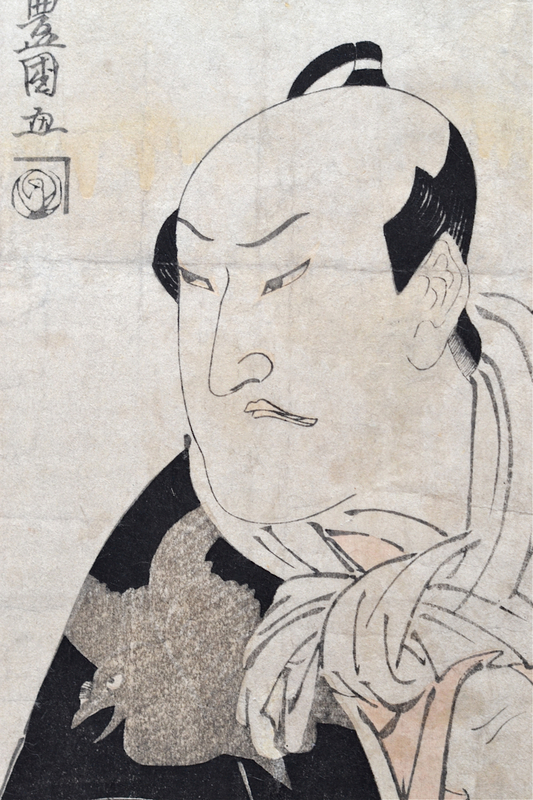 The print shows the actor Sawamura Gennosuke as Ume no Yoshibei from the play Suda no Haru Geisha Katagi; the drawing and the deft characterisation of the gesture are typical of Toyokuni’s mature style, although the print itself appears to be unknown. Sawamura Gennosuke is shown playing the role Ume no Yoshibei, a Robin Hood character or otokadate. These were street gangs, the forerunners of the modern day yakuza, who were said to protect people from lawless samurai. In the play, Yoshibei murders a young man for money and during the fight, Yoshibei’s finger is bitten off. The victim turns out to be the brother of Yoshibei’s wife Kuomi. Kuomi finds Yoshibei’s finger in her dead brother's mouth and realises that he has been murdered by her husband. She kills herself in grief, having cut off her own finger. The black crows on the kimono of Ume no Yoshibei symbolise bad luck. Kunisada borrows the overall pose and composition for a print of the same subject, fifty years later. This is a very fine print, over two hundred years old. The drawing is deft and the design of the stylised birds realised in texture against the heavy black of the robe are exceptional. Colour is well preserved, the impression is very fresh and crisp and the condition is good overall if a little worn, especially at the edges.